Eating seasonally is such a pleasure. These whole foods are often in surplus at this time of year so we use them up in this mix. Using lemon juice with the apples will help keep the apples fresh by preventing oxidisation. This recipe keeps things raw, simple, nutritious and delicious and as a result has a hight nutrient density. If you like red cabbage recipe take a look at our recipe for homemade Sauerkraut. For a list of all the seasonal produce available in Autumn visit here. Tips on how to align with Autumn from a Chinese medicine perspective can be found here. Shura has written an article for Nature and health magazine on Autumn, you can find it here. 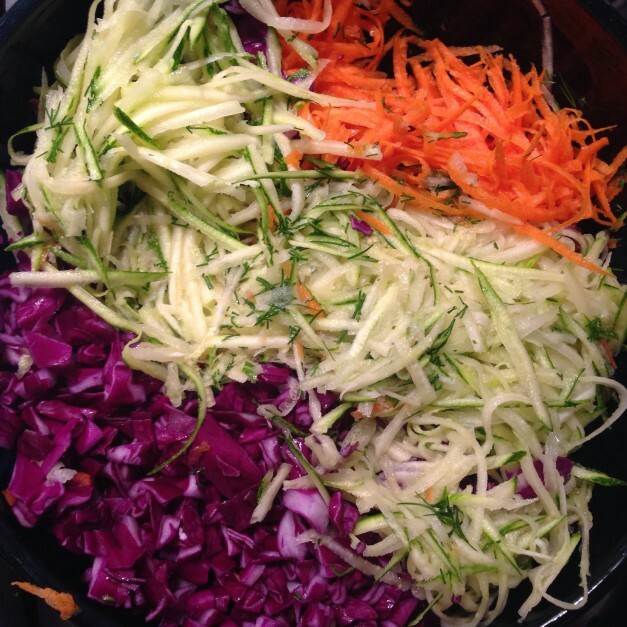 Shred cabbage and grate zucchini and carrot. Mix thoroughly. Grate apple and mix with lemon juice and add to main mixture with dill and combine. Add vinegar and oil and season with pepper then serve.